Please click here to read the rest of the strike at its source. There are altogether twelve parts. Running across multiple broadsheets internationally through the AFP: China now has both the longest and fastest train link in the world despite initial hiccups. Utilising tech developed with foreign partners such as Seimens and Bombardier, this network of high speed lines are five years in the making after first being unveiled at about the time of the Beijing Olympics. In that time they have built 5,000 miles of high speed rail lines. I had the opportunity to take the high speed rail from Shanghai to Hangzhou where it reached a top speed of about 321km/h, though that was prior to the deadly collision in July 2011. U.S. – 135km/h – shared rails with conventional trains, however. The world’s longest high-speed rail route, running from the Chinese capital Beijing to Guangzhou in the south, will open for business on December 26, state media said Saturday. Travelling at an average speed of 300 kilometres (186 miles) per hour, the line will slash journey times linking Beijing in the north with the country’s southern economic hub from 22 hours to eight hours, the China Daily newspaper said. A most interesting piece from the BBC on China’s love-hate relationships with things foreign – indeed they spent millennia building a string of walls Ripley’s Believe it or Not claimed could be seen from outer space (yes that is the genesis of the fantastical notion that became part of some school textbooks). The study of Kublai Khan provides unique insights into what it takes for the Chinese mind to subsume a different paradigm of thinking into their collective identity. For those who are fans of Star Trek, the Chinese, in my mind, are not unlike the Borg – they learn, assimilate making it their own. 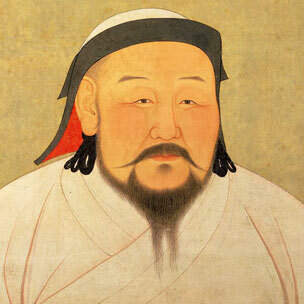 Kublai Khan who demolished 1,000 years of more or less united Chinese rule by setting up the Yuan Dynasty, a feature of which saw a Chinese civil service – “For the Song, it would been absolutely inconceivable that the Mongols could take over the whole of China,” says John Man, author of a biography of Kublai Khan. China has a love-hate relationship with what is foreign. Traditionally all people beyond the Great Wall were barbarians – only part human. But invaders have sometimes been welcomed, in time, into the Chinese family. One was Kublai Khan. In the 13th Century, no-one knew how big the world was so it was not so wild for the Mongols to set off from the grassland with the idea that they were going to conquer all of it. Rail safety and the 350km/h benchmark: China considers rebuilding the Harbin-Dalian high speed railroad, its northernmost, 904km long high speed railway. With temperatures dropping to as low as -40 degrees C in the area, Wang Mengshu, the chief engineer of the China Railway Tunnel Group warned the Global Times certain parts of the railroad were not designed right at the onset. China’s sprawling high speed rail network may be one of the prides of nation-building, but there have been problems, like the Wenzhou crash last year. China Railway Tunnel Group is member enterprise of the state-owned China Railway Engineering Corporation 中国中铁, the third largest civil construction enterprise in the world with 220,000 employees. Part of the newly built Harbin-Dalian high speed railroad connecting Northeast China’s Heilongjiang, Jilin and Liaoning provinces is now facing reconstruction due to roadbed deformation, an expert said on Tuesday. Wang Mengshu, chief engineer of the China Railway Tunnel Group and academician of the Chinese Academy of Engineering, told the Global Times that certain parts of the railroad were not initially designed properly. Chunyun 春运 is both a ‘glimpse’ into the Chinese mind of familial piety, and a reflection on the tenacity of the Chinese to facilitate this through a commitment to vast transport networks. 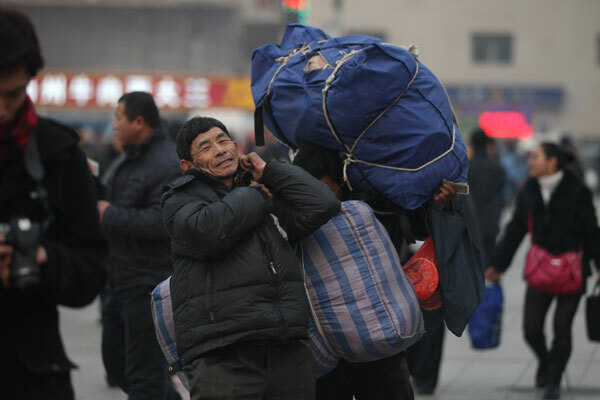 The Chinese spring festival or Chinese Lunar New Year sees one of the largest human migrations on the planet. I for one have joined the ‘hoard’ by returning home from Australia to reunite with family to usher in the year of the Water Dragon. For reference, the heightened traffic load lasts about 40 days and starts 15 days before the Lunar New Year. In 2008, the number of passenger journeys within China exceeded 2 billion. That’s moving 2 times the population of India, or more than one China in a period of little more than a month. It can be easy to criticise the faults, but lest we forget, it surely is one of the most complex operations ever, to get so many people home in time to be with family. Hu Yadong, the deputy minister of railways expects the railway system this year to handle 5.88 million trips a day. It doesn’t quite help that the Chunyun this year, like many before, is being blitzed by snow and rain. Whatever it is, they key takeaway is clear – there are few other priorities for the Chinese apart from being with family at this time of year. Snow, rain and fog may hamper plans of millions bound for their family reunions. BEIJING – Two highspeed rail lines were hit by extensive delays in the past few days and the system will be tested by snow and rain forecast for the coming week. More than a dozen services on the Beijing-Shanghai high speed line were held up for as long as two hours on Saturday, just as the Lunar New Year travel rush began to reach full swing. 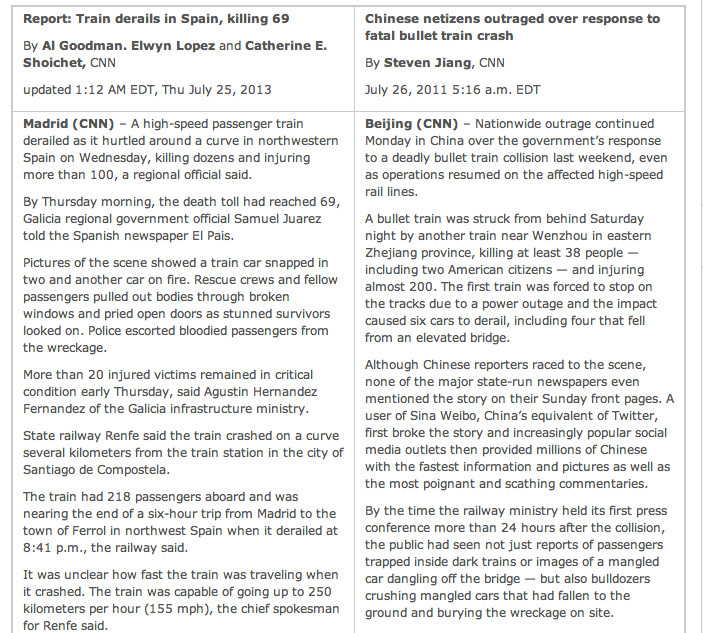 In this instance, she reveals that little has changed over China’s handing of disasters such as this, with news that officials had ordered the damaged train carriages buried, and that China’s Railway Ministry has been less than forthright about what caused the crash, offering only vague responses to reporters seeking details. For the past month, I have been a regular commuter on China’s high speed trains, zipping up and down the country between major cities including Nanjing, Wuxi and Shanghai. On my first ride, I marvelled at the sleek, white carriages, the spotless interiors, the warmth of the service staff, and above all, the smoothness and comfort of the journey. The Wall Street Journal reports an ‘unusual’ admission of illness, something Chinese leaders rarely do. 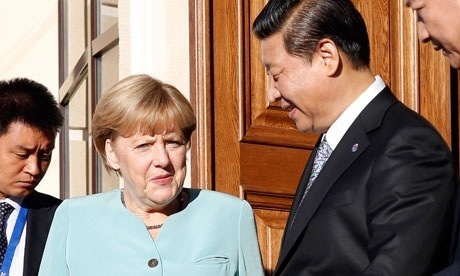 Now could this be a measured move, or increasing humanisation the Chinese leadership’s legitimacy to lead. 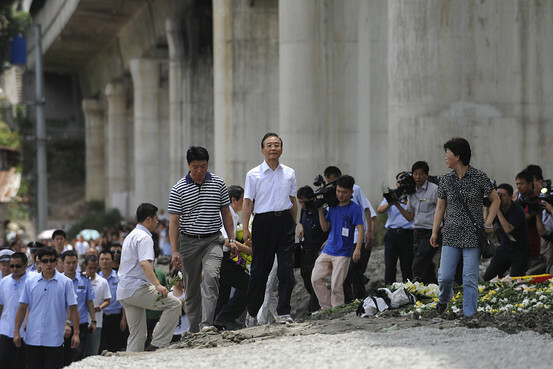 Premier Wen in this instance shares that he has been bed-ridden for eleven days, which was why it took him five days to visit the crash site of the Wenzhou high-speed rail collision. This post has been changed since it was first posted. See below. Why did it take Chinese premier Wen Jiabao five days to visit the site of Saturday’s deadly high-speed train collision near Wenzhou? The answer, according to Mr. Wen: He was sick. Unfortunate news. There had been talk earlier that corruption (Corruption Hits China’s High-Speed Railway, FT/CNBC March 24 2011) could put a grinding halt the high speed rail project with breakdowns as recent as this month – High Speed Rail breaks down again (China Daily, July 14, 2011). 58 trains have been suspended and the fault has been identified as lightning-triggered. 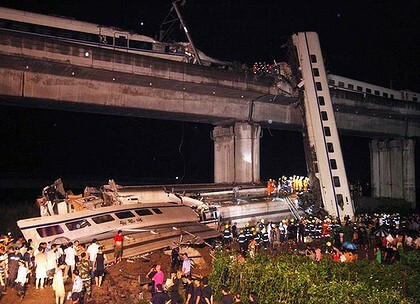 In Chinese fashion, the accountable will be hunted down and made an example of – Senior officials sacked after deadly train collision (China Daily, July 24, 2011). Although this line from Hangzhou to Wenzhou which I have taken is another altogether, and older. A toddler was rescued about 21 hours after a crash involving two high-speed trains in eastern China killed at least 43 people and injured more than 200 others, state media reported. The unconscious child was found early on Sunday evening while rescuers were clearing one of the train cars just as the cleanup efforts were almost completed. It cited an unnamed firefighter.